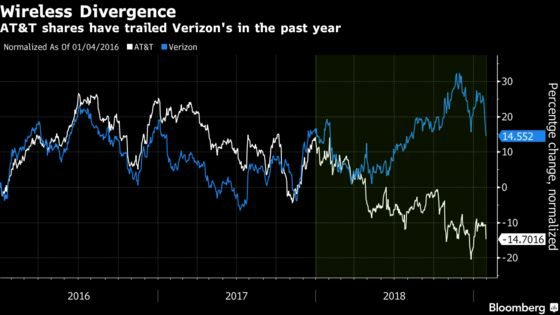 (Bloomberg) -- AT&T Inc., in the middle of a high-stakes effort to turn itself into a media and entertainment juggernaut, finds itself playing catch-up in its bread-and-butter businesses of wireless and pay-TV services. Two key measures, U.S. wireless and pay-TV subscribers, came in well below Wall Street predictions in the fourth quarter. That led to a shortfall in overall sales relative to analysts’ estimates. The stock fell as much as 5.5 percent Wednesday, the biggest intraday drop in three months. AT&T added a net 13,000 U.S. monthly wireless subscribers in the period, way under projections of about 252,000. A loss of 410,000 users of nonphone devices like smartwatches and tablets drove the disappointment. AT&T fell victim in part to the same phenomenon that’s bedeviling Apple Inc. and other phone makers: People are hanging onto their smartphones longer. The Dallas-based company’s phone sales fell $500 million in the recent quarter due to sluggish upgrades, Chief Financial Officer John Stephens said on an earnings conference call. The figures look even worse in contrast with AT&T’s biggest rivals in mobile services. Although Verizon Communications Inc. reported downbeat fourth-quarter sales on Tuesday, that company and T-Mobile US Inc. each gained 1.2 million new wireless subscribers in the quarter. AT&T’s monthly defection rate, or churn, rose to 1.2 percent from 1.1 percent a year ago. AT&T shares were down 5.4 percent to $29.02 at 9:58 a.m. in New York trading. The stock lost 27 percent last year, lagging behind the 6 percent gain of Verizon. AT&T’s “top priority” is reducing its debt, Chief Executive Officer Randall Stephenson said in a statement, and its record free cash flow in 2018 will help that effort. The company had net debt of $171.3 billion at the end of the year, having taken on a heavy load to finance its Time Warner acquisition. With that $85 billion purchase last year, AT&T is gambling that entertainment programming, delivered to home TV sets and to mobile phones, can spark its sluggish revenue growth. The completed merger is facing a court challenge by the Justice Department, though AT&T appeared to fare well in a December hearing. The pay-TV division, led by DirecTV, is continuing to lose customers to fast-growing online businesses, like Netflix Inc. Using content from Time Warner, AT&T is developing online businesses of its own, such as WatchTV, but those will take time to catch on. Sales rose to $47.99 billion, short of the $48.5 billion average of analysts’ estimates.